Five works of fiction entered Tuesday night with the chance to win the inaugural Aspen Words Literary Prize. 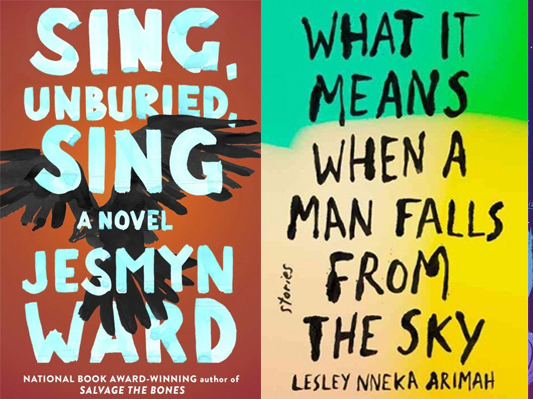 As stories of immigrants and refugees, past hardships and hopes for the future, these novels and short story collections contain multitudes — but they also share something important, in the minds of Aspen judges: They shine a piercing light on some of the messiest, most difficult social issues of our day. But just one work won the prize: Exit West, by Mohsin Hamid. The first thing that stunned head judge Phil Klay about the novel, which is centered on the turbulent lives of refugees, “was just the exquisite sentences,” he said. Along with the prize, Hamid is bringing home a hefty $35,000 purse. The jury selected its winner from the crop of finalists announced last month, which also included: Lesley Nneka Arimah’s short story collection What It Means When a Man Falls from the Sky; Samrat Upadhyay’s collection Mad Country; Jesmyn Ward’s novel Sing, Unburied, Sing; and Zinzi Clemmons’ collection What We Lose. The ceremony at the Morgan Library also featured a wide-ranging conversation between NPR’s Michel Martin and Arimah, Clemmons and Upadhyay, who reflected on their origins — and their responsibilities — as writers. “I read a lot growing up,” said Arimah, who grew up partly in Nigeria. And she wasn’t kidding: She recalled heading to the library with her sister when they were young, with their father’s duffel bags in hand. Then, they would each check out the maximum number of books allowed — which in this case was 50(!) — and read all of them, before trading their piles with each other. Years later, she says the vast array of styles she’d read wriggled into her own debut fiction collection. And that really does mean it is important to be “writing for me,” she said, “and not to educate and not to inform” — meaning she finds African writers are often expected smooth over complexity or craft easily valorized characters, in the interest of being the “voice of” their countries and cultures to the West. Which may be surprising, given the mission statement of the prize. Founded by Aspen Words, a nonprofit literary center established by the Aspen Institute, the award aims to boost writers who grapple with “the messiness of reality and human experience,” as Klay told NPR when the shortlist was unveiled. “These are the books that we think are most vital for understanding who we are as a people, as a country, as a world right now,” said Klay, a National Book Award-winning fiction writer himself. But to Upadhyay, who lived in Nepal until 21, and Clemmons, whose South African mother and American father raised her in Philadelphia, the desire to reflect and change the world wasn’t what drove them to write. Above all, they said, they simply want to tell a story that draws their readers in — and all the rest will follow. If his writing expands readers’ perspectives, as this prize has recognized him and his fellow finalists for doing, “it’s icing on the cake,” said Upadhyay, who now teaches at Indiana University.